Morocco has been on the horizon for a couple of years yet this trip was very last minute with no planning other than return flights to Marrakech. A wee bit of research and we had the week planned out with rock climbing, mountain biking, surfing and making the most of the vibrant colours and architecture. Then I came down with flu. I’ve always shunned the flu jab at work as I’m one of the fortunate who ‘never’ gets sick and don’t have a lot of patient contact. After battling for a week with several failed attempts at trying to go into work, I boarded the plane with Julie and Andy feeling like my head was on the brink of exploding before we even took off. Kick in pseudoephedrine, kick in. I’ve spent a fair amount of time in sub-Saharan Africa but this was the first visit to North Africa. I must admit I never actually felt like I was in Africa, at least not the Africa I know. Morocco comes with the luggage tag of sexual harassment for women so I was expecting Andy to be working overtime as a chaperone. Beyond the locals trying to entice you into their shop or fish stall, we didn’t really encounter any problems. Walking through the windy streets after dark similarly didn’t cause concern. 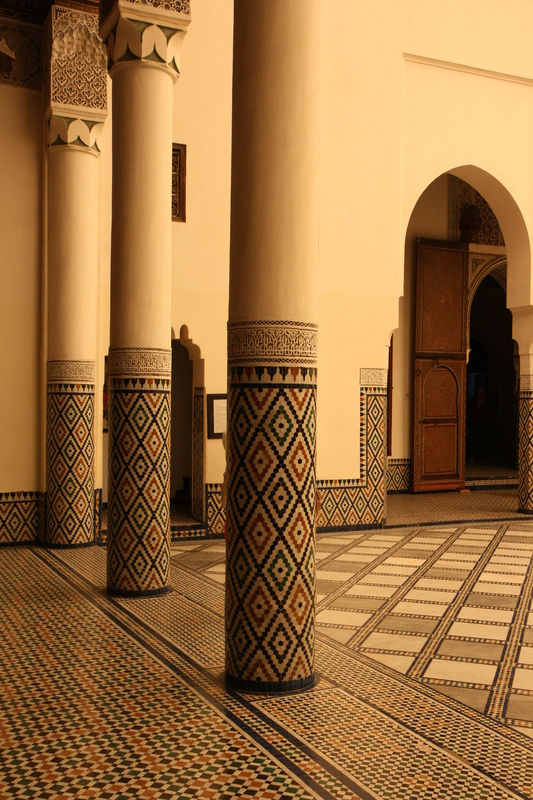 Marrakech was our first base and we stayed in the delightful Riad Cherihane. A wonderful roof terrace abundant with plants and two tortoises was the perfect retreat from the bustle of the streets below. Signs of western influences run alongside the Berbers, Morocco’s original inhabitants. The Medina (old town) is a fascinating place. On the fringes of the Souks (markets), shops fixing up old motorbikes and bicycles neighbour the butchers which host live poultry at the back and those who have met their fate hanging from a peg at the shop front. As you weave further into the Souks, Moroccan lights, slippers and spices lure the tourists. Motorbikes skim within an inch yet never closer. The aroma of spices and cooking meat is overpowered by motorbike fuel. Yet the medina has an allure. It never stops. 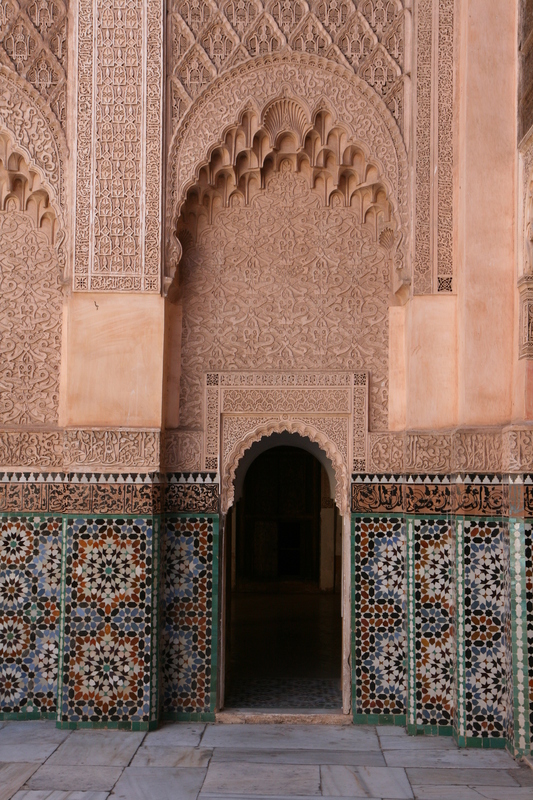 Ornate doors and arches break up the terracotta walls but there is no insight into the hidden interior of the mosques; the call to prayer is the reserve of the locals and the most non-Muslim tourists can catch a glimpse of is the shoe removal on entrance. The end of one souk opens up to the Marrakech Museum and Ben Youseff Medersa which hosts some classic Islam architecture. There are several surprising contemporary art exhibitions in the neighbouring areas which offer a retreat from the shop sellers calls. It’s always amusing how phrases like ‘cheap as chips’, ‘just like Black and Decker’ and ‘see you later alligator’ make it into the vocabulary of salesmen. The main square Djemaa el Fna hosts a circus of henna artists, snake charmers, storytellers, musicians which give up some of their space to street food vendors at night. It reminded somewhat of the Royal Mile during the Edinburgh Festival with an amazing energy and tourists either looking on in wonder or trying to avoid the hat that gets passed around at the end of a juggling performance. We were advised to avoid the black henna which apparently contains some acid type ingredient that damages the skin but it’s not my cup of tea anyway. 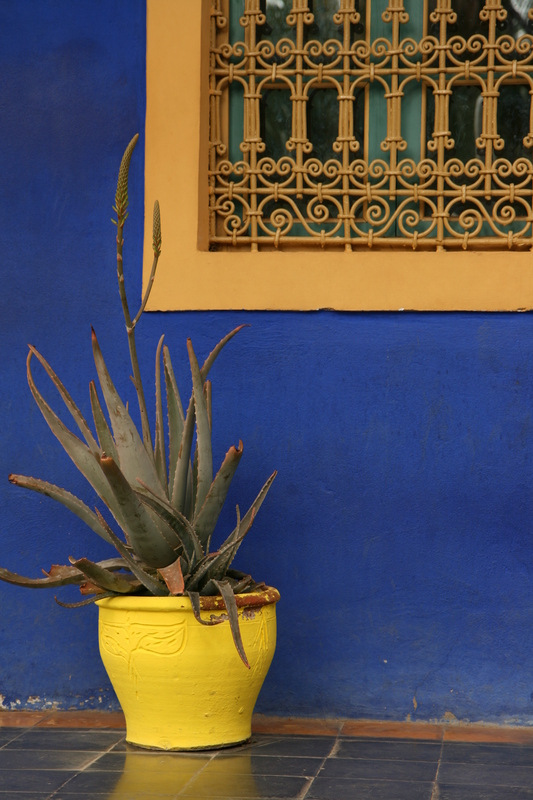 Marrakech houses the Marjorelle Gardens, owned by Yves Saint Lauren, which provide a place of calm where Palm trees and cacti are juxtaposed against bright blue, orange and yellow paintwork. This place seemed a world away from the medina. The High Atlas Mountains are easily visible from Marrakech and seem surreal with their snow capped peaks, almost like a painted horizon. We headed to Imlil for the day which lies close to the highest mountain in Morocco Djebel Toubkal (4167m). It only takes about 1.5 hours by car and the journey passes through cultivated fields enclosing an almost dried up river. The snowfall was poor this year so I’m not sure how much more water will flow. We went on a hike through the Berber villages and found good vistas of the High Atlas at almost every corner. We weaved up the back of houses up a rubble path, sharing it with small children, chickens and heavily laden mules. At 2000m I was feeling the effect of my bad chest but the air was clean. We crossed the moraine of a glacier and the snow line was a stone’s throw away. The summits seemed within touching distance and I imagine the 4000m altitude catches a few inexperienced climbers out who don’t allow time for acclimatisation. Essaouria is a coastal town with heavy French influence. We stayed at Dar Darek which was owned by a French couple and had a completely different take on a roof terrace. Our first couple of days coincided with an intense wind coming off the Atlantic. 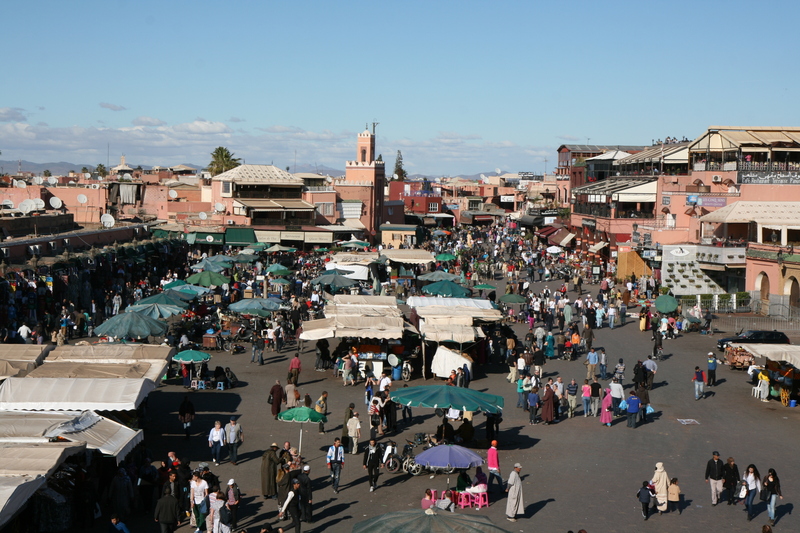 This place was very calm after the bustling Marrakech and there were lots of tourists around on day trips. 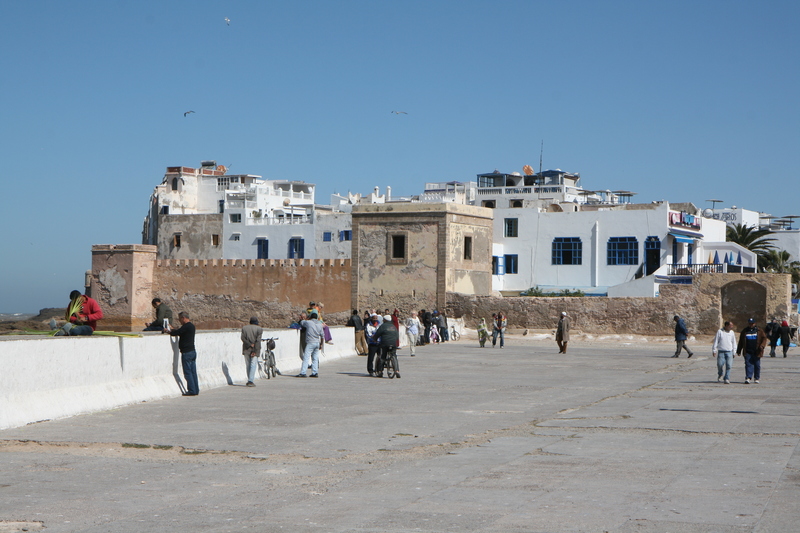 The town is enclosed by battlements and a collage of whitewashed and blue buildings. 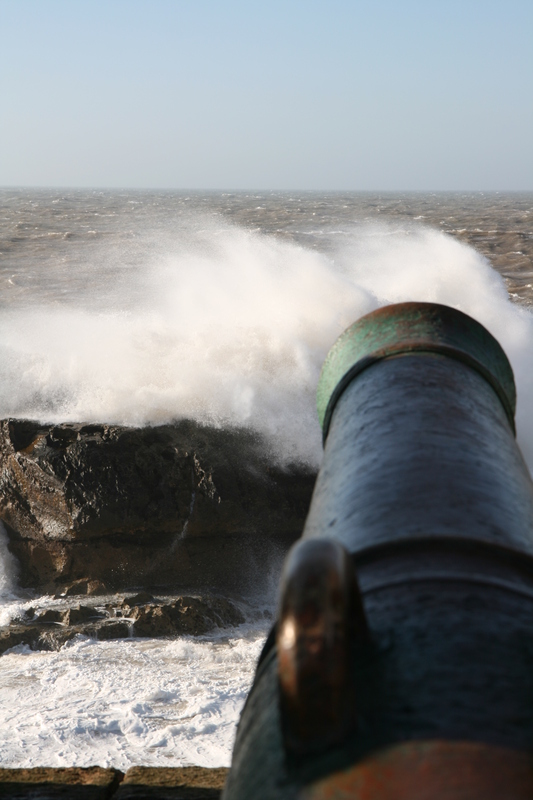 On the North West side of town, cannons line the way to North Bastion with panoramic views out to sea. 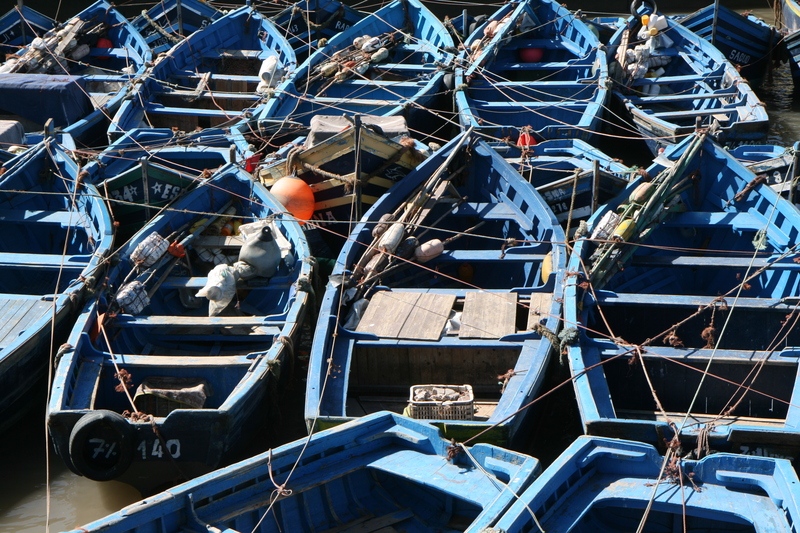 The port is Morocco’s third largest and full of local fishermen repairing nets and boats. Just outside, are a collection of fish cafes where the workers get pretty fierce competing for your appetite. The beach stretches for miles and if you fancy a camel or horse ride is the place to be. We even got the offer of an elephant ride. More importantly, the wind dropped on our last day and some glassy waves paved the way for some fantastic surfing. The beach and water are not a patch on those at home on the west coast of Scotland but it was certainly nice to be surfing in water other than the North Sea in winter. There are plenty of reasons to return to Morocco, hopefully next time I will be well enough to enjoy them. This entry was posted in Outdoors and tagged Morocco on 22/04/2014 by Mangoventures.